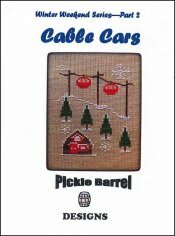 Winter Weekend 2: Cable Cars [H1556] - $6.00 : Yarn Tree, Your wholesale source for cross stitch supplies. Cross stitch pattern by Pickle Barrel Designs. It's a cold winter day & what a better day to hit the slopes! Snow is falling & the cable cars are reading to take you to the top of the slope! The warm ski lodge will have hot chocolate & goodies for you to enjoy when you need a break. Stitch count is 48 x 68.